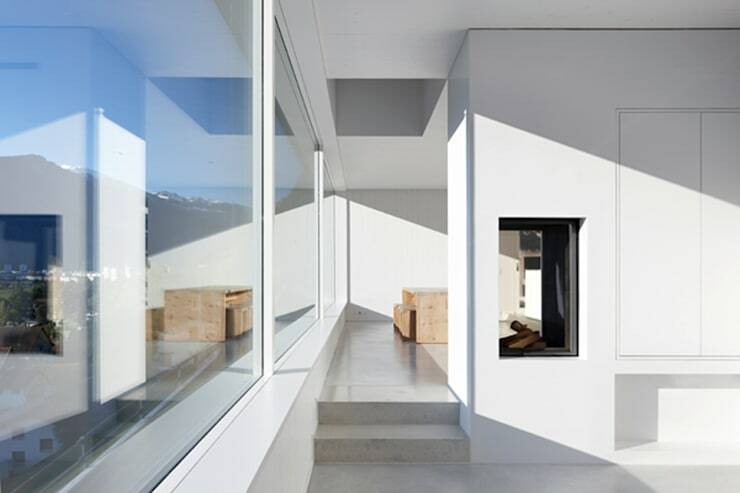 Let us travel to Haldenstein in Switzerland today, where come across a gorgeous home, designed by architect professionals Albertin Partner. 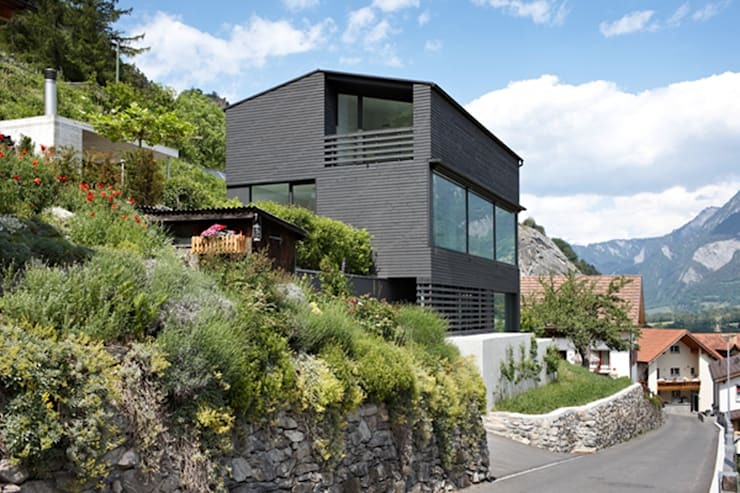 This home is molded into the beautiful landscape that surrounds it, while featuring a very distinct charcoal facade. Yet when we explore the inside of the home, we will see that it is distinctly different from the outside as it is dominated by clean white tones. This is why the home is a bit like a coconut, with its rich variation between the exterior and the interior, while still revealing some delicious surprises. If we look at the home from this angle, we can see it is made up of many different storeys as well as how it fits seamlessly into the mountain behind it. 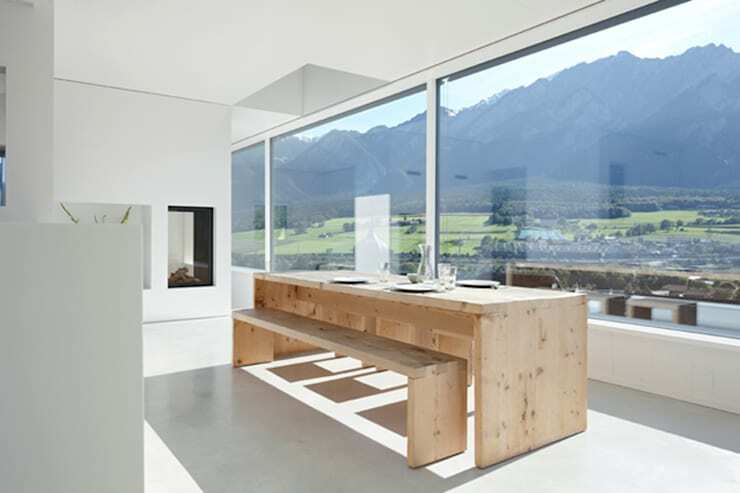 The designers truly worked with the landscape that surrounds this home, installing large glass windows throughout so that the family has panoramic views of the mountains, fauna and flora. We can also see that they've invested in some outdoor balcony spaces, allowing for a seamless transition between the interior and the exterior. 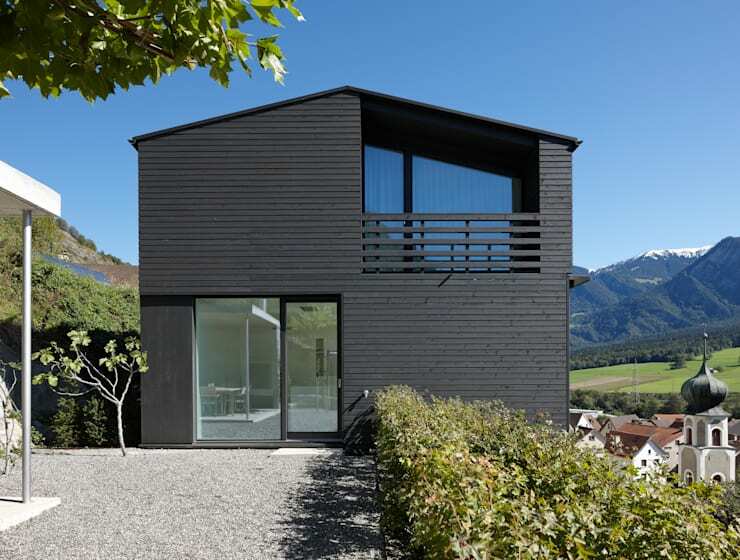 The charcoal wooden facade contrasts beautifully with the lush green vegetation on the slope that surrounds it, yet it also works incredibly well with it. It almost looks like a large stone, making up the mountain. From this angle, we can see how thanks to the landscape, the home takes on different perceptions. From here, it looks like it is just a simple two-storey home, with a gravel driveway that leads up to large glass doors. The designers truly played with the different heights of landscape, creating a layered home that looks different depending on where you look at it from. The gravel driveway is not only functional as a durable spot to park cars, but it also looks gorgeous too. The light grey enhances the charcoal tones of the home, while contrasting with the green surrounds. From this angle, we can also see how the balconies and glass windows create wide open spaces throughout the home. 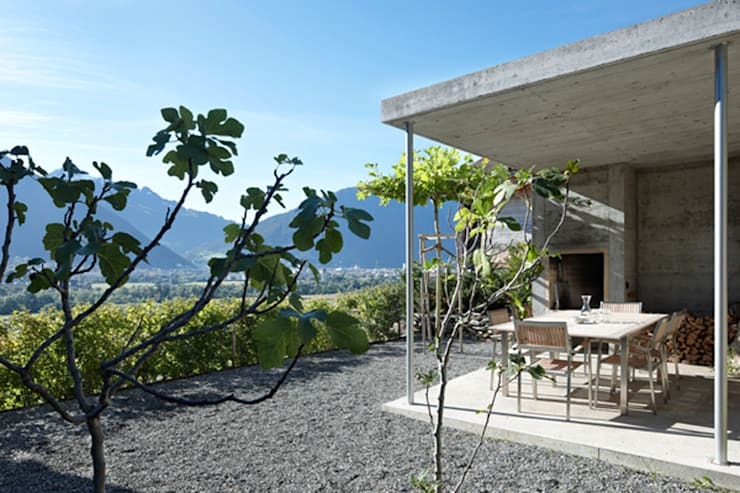 Here we can see how the designers really played with the surrounding views and landscape available to them, thanks to this gorgeous sheltered terrace. The terrace features durable outdoor furniture where the residents of the home can dine, relax, read their books, entertain or share glasses of wine while taking in the views, no matter what the weather. This is a great addition to any home, making the living space that much larger while allowing for fresh air and sunshine. Have a look at these 6 easy steps to the perfect terrace for inspiration for your own home. Here we can see how lighter colours are starting to play a role in the design, contrasting beautifully with the darker colours of the facade. If we head inside the home, we come into the center of its brightness! The industrial chic screed floors work in harmony with the white walls, creating a very modern looking interior. You'll notice that there isn't anything in the the interior that isn't absolute necessary. The furniture and decor items are all functional and minimalist, ensuring that this space is neat, light and open. For a minimalist design, functional items often need to double up as decor elements, which is exactly what we can see in the form of this fireplace. It looks trendy, but it also warms up this space in winter! The large glass windows not only allow the family panoramic views of the surrounds, but it also ensures that there is plenty of natural light flowing into the home throughout the day. This is a great element in any minimalist design. The living room opens up on the dining room, which features a very simple dining room table with benches. These are a light wood material, bringing a touch of warm and homeliness to the very white interior. This also offsets the coldness of the glass. Wooden furniture is always a wonderful addition to a modern or minimalist home and it's also durable and budget-friendly too! If you like a touch more personality or colour in your home, a great option would be to add a pot plant, a small tree or a vase of flowers to a space like this. The kitchen is a sleek white design, which makes for a very clean, hygienic and chic looking cooking area. Don't you think it's like a blank canvas, where culinary delights are waiting to be created? You'll also notice that there isn't any clutter or chaos on the kitchen counter tops. All of the crockery, cutlery and glassware is stored neatly out of sight. This is because the designers have invested in smart storage solutions in the form of cupboards and drawers – a great tip for any kitchen space. These keeps it organized, neat and tidy. A must for any all white kitchen is natural light. You can even install skylights. 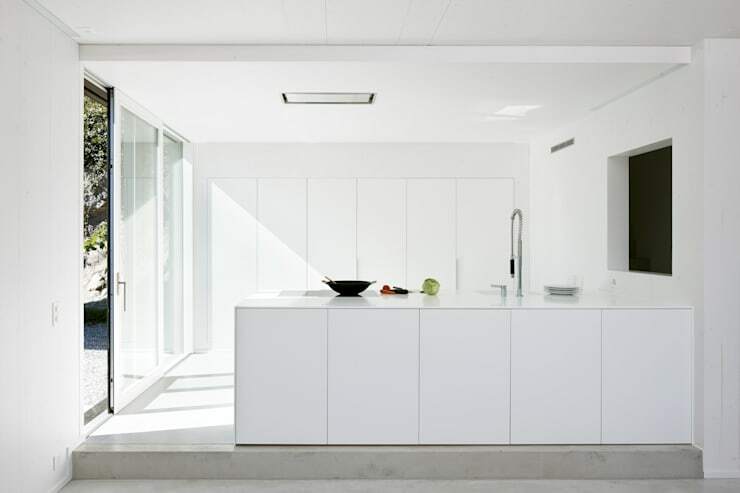 Have a look at these 10 all white kitchens for inspiration! This is a home that looks sturdy and homely on the outside thanks to the dark colours, but opens up to reveal a very chic and minimalist white interior that is simply beautiful!